Charming Brick Cape on a Quiet Street! View all 4 bedroom homes for Sale in North Haledon, NJ. Love the outdoors? This private yard backs up to High Mountain Park! Zebaida Group proudly presents our newest listing, a 4 bedroom brick Cape Cod at 95 Hillside Dr in North Haledon, NJ 07508. This Brick Cape on quiet street offers tons of possibilities! Bring your decorating ideas to make this home your own! The main level includes a living room with a wood fireplace, formal dining room, kitchen, two bedrooms and full bath. A bright sun room offers extra space for year round enjoyment. Upstairs are two more bedrooms and the lower level offers a finished recreation room with wet bar, laundry room and access to the garage. This private location offers easy access to main roads and High Mountain Park in the backyard! View all homes for sale in North Haledon, NJ. 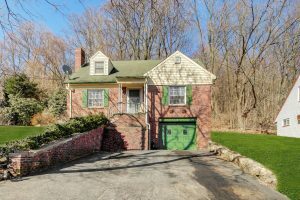 Search all Cape Cod style homes for sale in North Haledon, NJ. The Outlets at Bergen Town Center has a huge selection of stores and some really great sales. The Center City Mall in Patterson is a smaller shopping mall with a movie theater. North Haledon and its surrounding areas offer some great dining options. Nadie’s Touch of Pasta in North Haledon offers delicious chicken, seafood, veal, vegetarian and pasta entrees. Cinco de Mayo, also in North Haledon, in known for its friendly staff, authentic fresh food in generous portions and delicious drinks. Bottagra in nearby Hawthorn brings a modern Mediterranean flare to a traditional Italian restaurant. The North Haledon School District is home to Memorial Elementary School, serving grades K-4, as well as a Pre-School Disabilities Program, and High Mountain Middle School serving grades five through eight in the North Haledon School District. For ninth through twelfth grades, public school students attend Manchester Regional High School, which serves students from Haledon, North Haledon, and Prospect Park. New to the North Haledon area? Our website is full of useful information for new residents. If you are thinking about buying a home in North Haledon, NJ, the Zebaida Group would love the opportunity to help. If you are selling a home in North Haledon, Robert and Marlisa Zebaida would love to show you how, through strategic pricing, proper condition and staging, and their expert marketing; you are likely to get your home sold quickly in today’s North Haledon, NJ real estate market. Zebaida Group provides an exceptional level of real estate services to home buyers and sellers in North Haledon, NJ. If you have specific questions relating to homes and Real Estate in North Haledon, NJ give us a call at 973.379.7030, or email us at info@zebaidagroup.com. To learn more about North Haledon, NJ, we invite you to visit www.ZebaidaGroup.com! Call or email us today for a showing of this 4 bedroom brick Cape Cod for sale in North Haledon, NJ!